A thank you from us in the form of a little sunshine: Fresh pineapple sorbet. First, let us begin by thanking you all for the wonderful comments last week. They were warm little rays of sunshine in the middle of the night as we began to adjust to the hours young Jack is keeping. Second, the wife is doing great. She’s up and likely too mobile and too active for her own good. It was only after a dirty look I gave her and a remark about stitches that she slowed down. However, because she is a human vending machine, on demand at all hours, she is a bit fatigued and I wanted to keep up with demand for both baby photos and delicious food. Finally, since I’m a solo act again, I bring you a simple dessert that has turned out to be one of my favorites, Fresh Pineapple Sorbet. I’ve been on a tropical flavors kick over the past month, and this is perhaps one of the finest results. 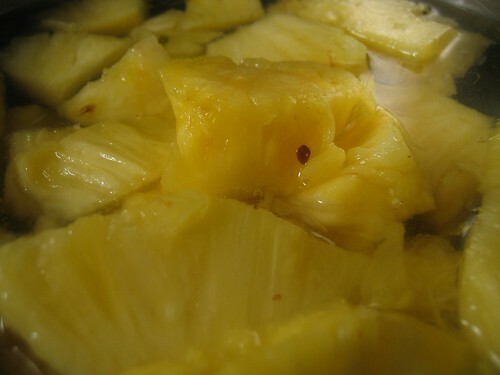 In addition to being refreshing, there is something pure in its flavor, texture and sweetness. It’s great as a palette cleanser, paired with other desserts such as coconut cheesecake, or as a stand alone. In closing, the recipe includes rum. Unless you have an issue with serving alcohol, I would recommend its inclusion. 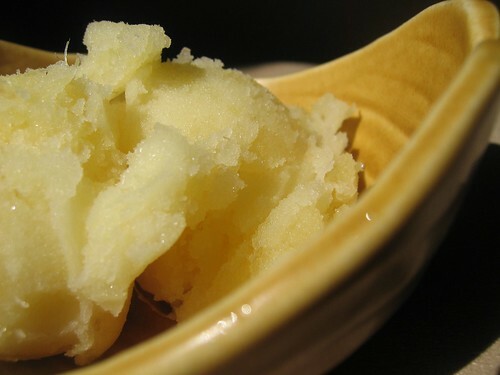 Besides adding flavor, the alcohol reduces the sorbet’s freezing point. 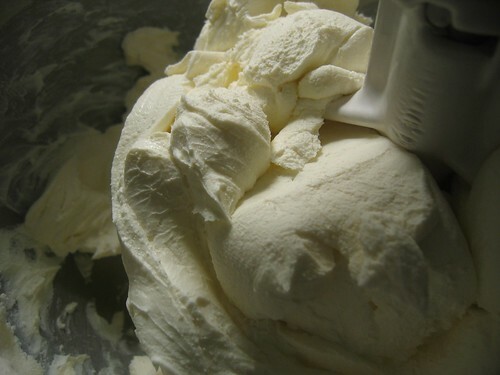 This allows the sorbet to maintain its smoothness after being frozen to harden. It will keep it easy to scoop, even after a few weeks in the freezer. Once again, thanks for your congratulations. I’m glad to be back in the kitchen. Watching what my wife was served in the hospital was rather appalling, and made me itch to be home! What’s a birthday without cupcakes? 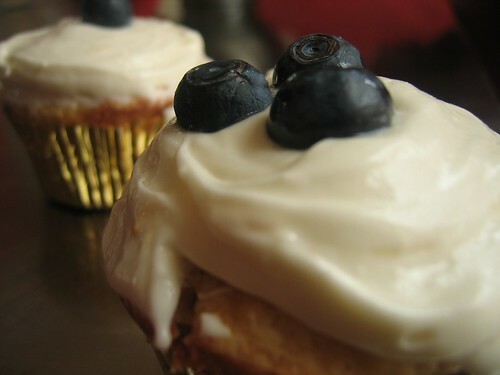 Jack’s Blueberry and Meyer Lemon Cupcakes. I’m happy to write this solo as my wife is currently recovering from the birth of our son. 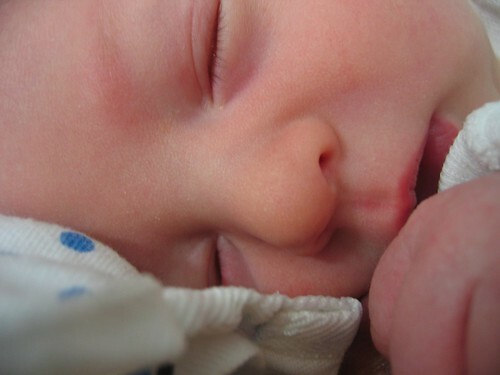 This morning, my wife gave birth to our son, Jack. 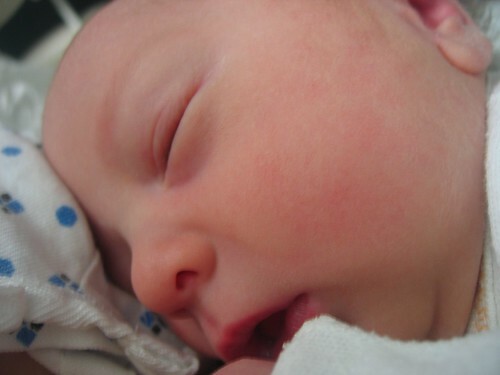 As he was breached and came to us two weeks early via cesarean, Jack weighs in at a peanut sized 6 lbs 6 oz. The wife is recovering and we will be back to our thing very soon, including the wife commenting on desserts. So to prevent this being self-absorbed, and bragging about how awesome my son is (I mean my son is awesome, just look at the little pink blob), I want to provide you with a recipe. 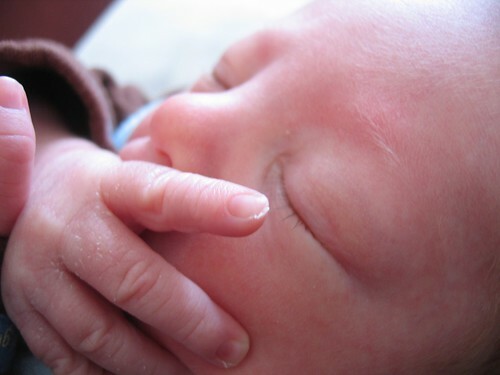 Before Jack was born all I could think about is the types of things I’ll need to do as dad. When cooking one day, I thought cupcakes. There is perhaps no more ‘hip food’ then cupcakes. Magnolia Bakery, Ina Gartnen (a.k.a. 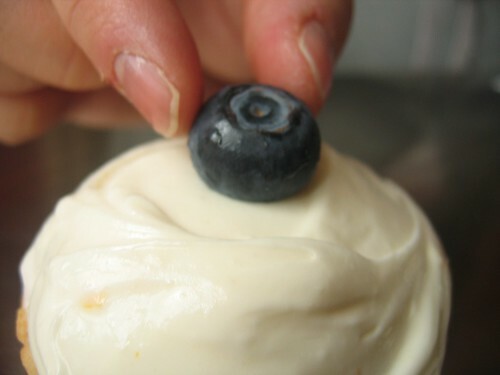 the Barefoot Contessa), and many others have made their names on making cupcakes. 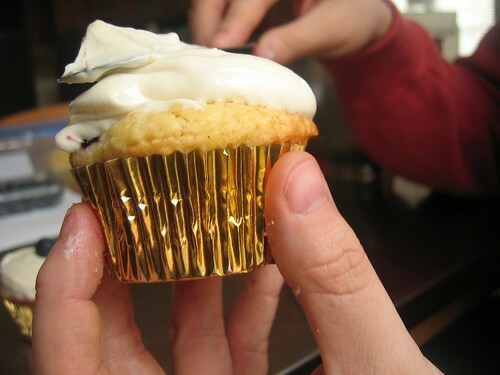 Heck there are great cupcake blogs out there like Cupcake Bakeshop and 52 cupcakes. So, while I have no skill in this area like these folks, I know parenthood means birthdays, and childhood birthdays mean cupcakes. Luckily, fate spared me a little blueberry tinted son. But before he was even born, I was experimenting with combining my wife’s favorites with the fresh, delicious taste of meyer lemons. The topper, and apparently best feature when I was testing these on my wife’s coworkers, was the meyer lemon cream cheese icing. 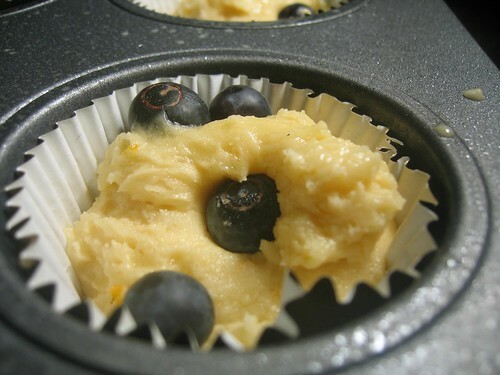 It is tangy, sweet, rich and smooth, perfect for the muffin-like yellow cake. Finally, we were terribly excited for his arrival. Jack is going to change everything. Knowing this, the recipe was prepared in advance so we have no comments from him. Hopefully, he’ll feel free to tell his old man soon enough what he thinks (or maybe I don’t want to know). We’ll be back later this week as we start our adjustments from a duo to a trio. 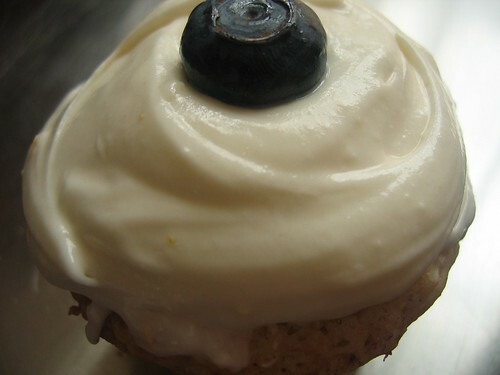 Click here to download the recipe for Jack’s Blueberry & Meyer Lemon Cupcakes. You know my husband is getting cocky when he tries to rumble with Betty Crocker. But that’s how I found him one recent evening: Staring, hard-eyed, at a box of her famous Bisquick. Apparently this dramatic face off was inspired by one of our favorite fellow bloggers, Mimi, of French Kitchen in America. She recently challenged her readers to come up with recipes using the famous product — or, actually, any biscuit mix, including homemade — whether up-market or down-home. My husband, of course, couldn’t resist, and decided to take on the original and iconic cooking behemoth, Betty Crocker’s Bisquick. … Hence, another evening when I come home to find disturbing evidence of his cooking obsession. Him and a box of Bisquick. About to cage match. Jeesh. 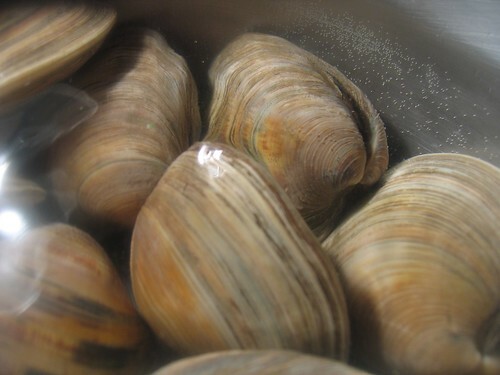 Problem is, I can’t complain too vociferously — or he won’t make me this Bisquick-and-beer battered fried fish again. 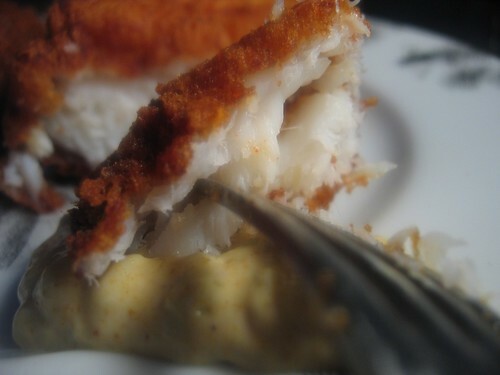 The classic fried cod that exited our stove had the appropriate and amazing crunchy top coat, made slightly and delightfully sweet from the magic Bisquick formula. The fish inside was cooked perfectly — moist, tender and steaming. All the seasoning was spot on, and bonus: The husband also made some delicious curried tartar sauce to match. And, of course, he also made chips (for what is fish without chips?) … bringing the sum total calories and fat of the meal to near-record levels. It’s actually very true… I was staring at a box of Bisquick. It sat next to me one night while watching TV. In fact, I know way more about Bisquick than I did before — because you can’t help but read the nutritional information and ingredients when staring at the box. Aside from some surprising stuff on the side label (let’s just say this isn’t a low-fat or low-cal meal), what you learn very quickly is that it is simply a modified self-rising flour. Once I understood that, I realized I needed a theme and a concept. 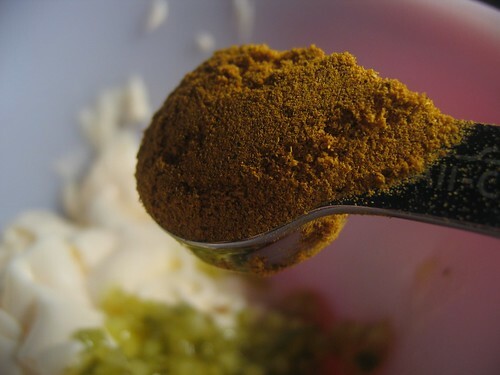 What good is an ingredient if it has no purpose? It didn’t take me long to realize my theme would be Ireland. I know Mimi has French heritage and has great passion for that country, but this time of year is about Ireland and Saint Patrick. Unfortunately, Ireland, like its despised British cousin, hasn’t had a great culinary tradition until recently. So I began to imagine stews with drop biscuits and various other hearty fare. Then it clicked. My wife and I were in Ireland a few years back, and I thought of one of the funniest sights on that trip. We were in Dublin, and my wife got fish and chips at this small chipper. In fact, the chipper was so small that there were no tables and it was all take away (notice the respect for the local lingo… not carry out like here in the States… it’s take away). She ordered haddock. The next thing I know, my wife is carrying around a huge hunk of fish. I’m pretty sure they just battered the whole filet and handed it to her. So, imagine her gnawing on a fried fish that is taken from a fish about as big as she is. It’s natural absurdist comedy. Thinking back on this, I knew wanted to make fish and chips. The only hang-up was the breading. 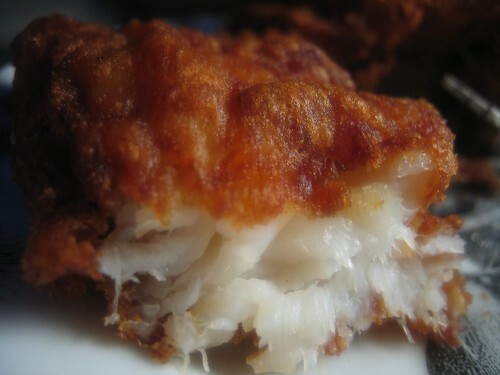 On most fried fish, the coating is just a flour with seasoning and leavener. I didn’t even need the leavener, since Bisquick gets you most of the way there. 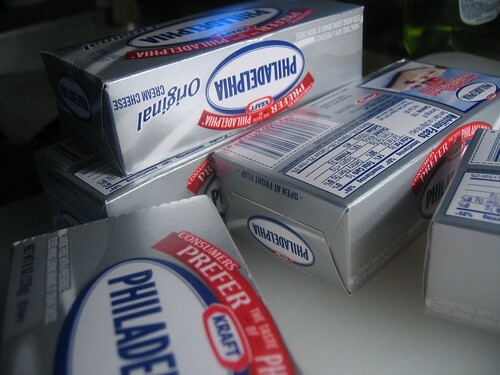 Plus, Bisquick has sugar and its own flavor. 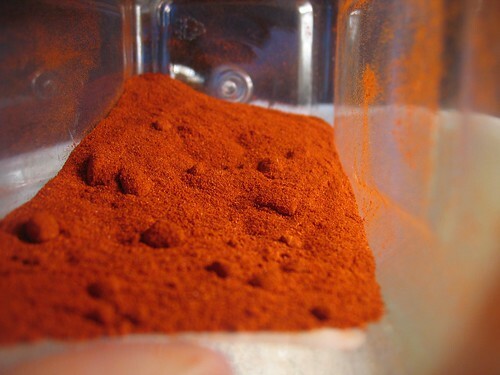 So I added some heat and dimension with paprika and cayenne, and used the beer to give it a bit more rise and flavor. The results were impressive. I was shocked how well it worked. The Bisquick has a lightness in flavor that keeps the batter around the fish sweet. There is actually more depth of flavor than when I’ve made similar dishes with regular flour. So, I’m delighted to share this with you as it was great lesson for me. Finally, there are a couple technical notes. First, after I decided to do this recipe, I caught an episode of America’s Test Kitchen doing a fish and chips episode. The show was very informative and I would highly recommend it (it’s a TiVo season pass for us). While I don’t use their recipe or even their breading technique, it did influence the choices I made, so I want to give a proper hats off to the folks at Cook’s Illustrated. 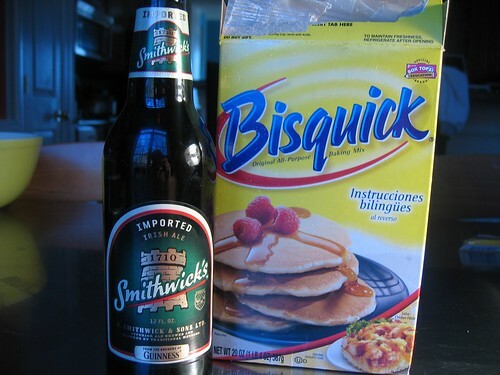 Second, I used an Irish red ale, Smithwick’s. It has a good depth of flavor. I suspect if you wanted to be even more Irish for the holiday, you could use Harp. However, I would stay away from Guinness or other dark stouts. I think the beautiful body and deep chocolate flavor would really undermine the lightness of the batter. Though, I would highly recommend drinking a Guinness with this. Well, I think it applies here. But I think there’s a problem with calling this dish “Cracker Jack Stir Fry.” (Just one problem?) Mainly that it might be misleading about its ingredients. 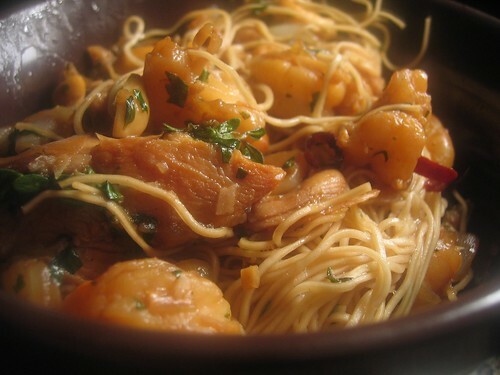 Alas, there are no carmelized popcorn bits or candied peanuts hiding amid the luscious noodles, shrimp, chicken and veg. This, friends, is special stir fry. What elevates it to “special” level? Something about the combination of herbs and sauces — the subtle play of salty soy, vinegar and fresh, leafy herbiage. 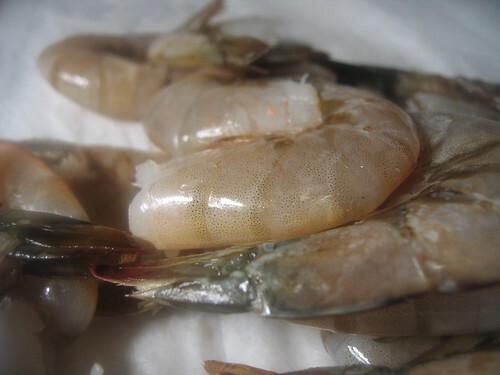 Something about the sweet and luscious shrimp and the tender, delicious chicken. 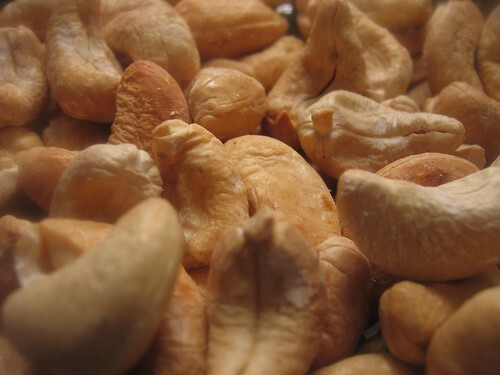 Something about the unexpected and delightful crunch of carmelized cashews. Something about the mounds of slender, seasoned noodles that are nesting all that goodness. 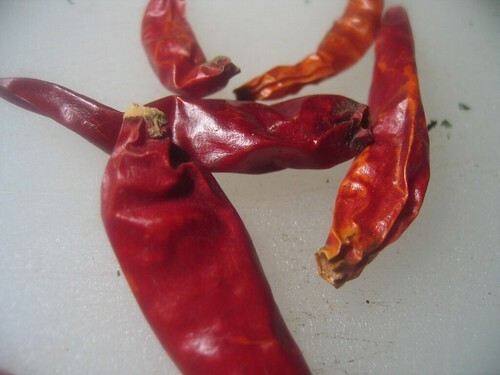 No, wait, I’ve got it: It’s something about the alluring heat of the fresh red pepper flakes and their tingle on your tongue. Well, wherever the magic resides, it is indeed “special.” Grab your fork and open your maw, Cracker Jack… The special stir fry is on. 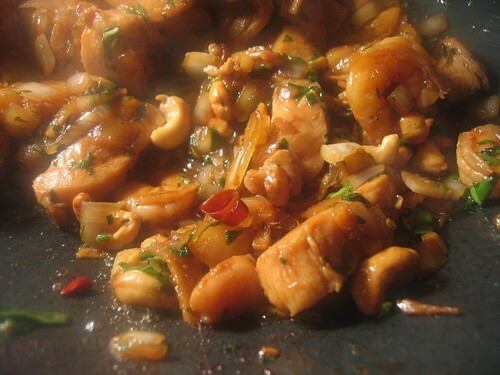 Click here to download the recipe for Special Stir Fry. At that moment, I knew I had done good. “Special” is a moniker few dishes get. It also means that it has to go into the rotation of dishes we do on a regular basis when not blogging or experimenting. In our house, it’s the equivalent of throwing “Ultimate” or “Classic” or some other super adjective in front of the dish. So I was strutting like a 6’2’’ rooster when I heard “Special” tacked on to this dish. 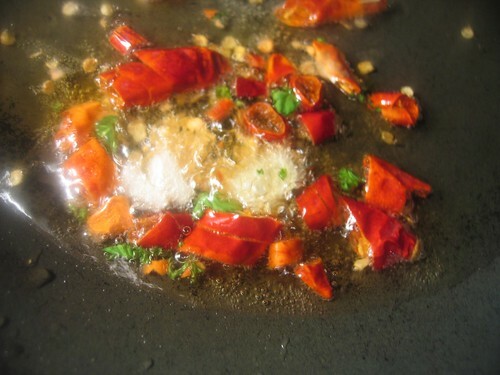 When designing Special Stir Fry, I wanted that freshness and lightness that so many Southeast Asian dishes have. However, since I’m not familiar with their cuisines beyond a few scarfs here and there (I’m allergic to peanuts so I have to be careful), I tried to imagine that freshness while balancing the five flavors. What are the five flavors? 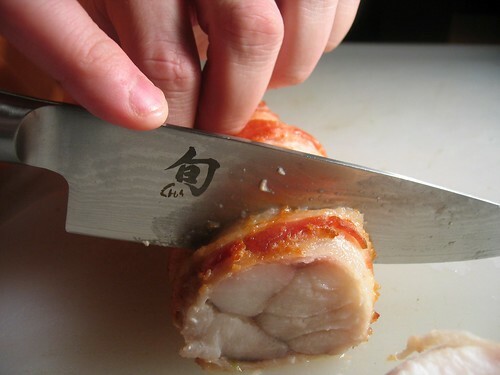 In many Asian cultures, cooks speak of balancing sweet, salty, sour, bitter and spicy in order to create the perfect meal. The idea is that these flavors must be in harmony for the most enjoyment — the culinary version of feng shui if you like. So in this dish, I tried to keep the five flavors as my guide posts. Well, I can’t reward him any points for originality/creativity… but I can give him mad props for deliciousness. 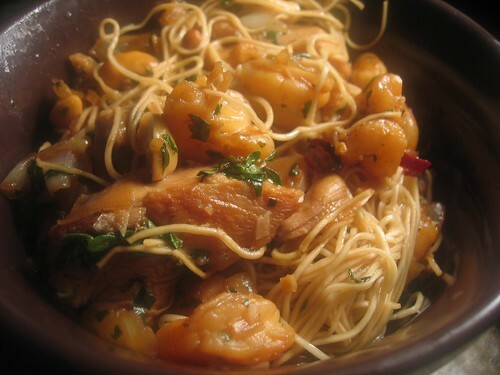 Whatever you call this dish, it has tastiness in spades. It’s hard to pinpoint what really seals the deal on a dinner this complex and satisfying. Could it be the rich tomato-based sauce coating the mounds of freshly made pasta? 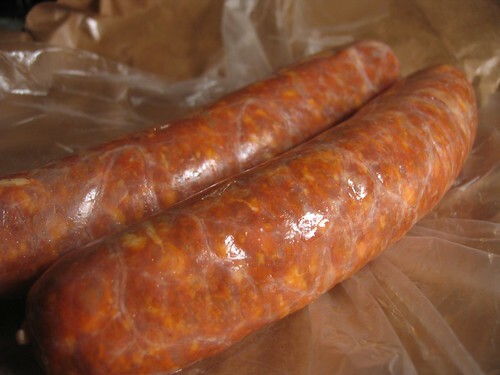 Perhaps it’s the smoky, spicy chorizo sausage hiding like treasures throughout? Maybe it’s the sweet and delicate shrimp morsels? 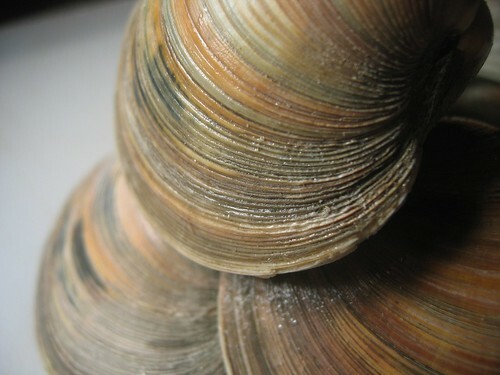 Or could it be the fierce and seductive clams, lending their hint of the sea and their decorative shells? Hmm… Obviously this is going to take more “research” on my part. My fork, please, darling. 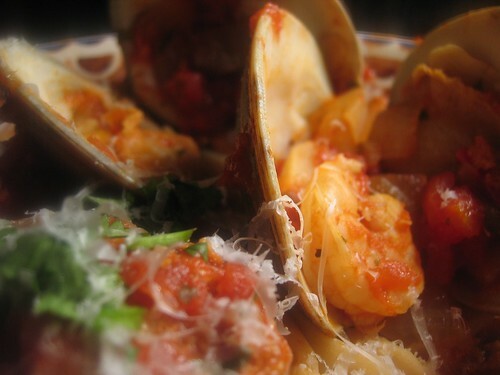 Click here to download the recipe for Seafood and Chorizo Pasta. Alright… So this is, hopefully, the last of my super-sweet torture devices for my beloved pregnant wife. In fact, my wife, who cannot eat sweets until our son is born, gave me the OK and was even my prime consultant on this recipe. The brilliant crust was all her concept…. but I’m getting ahead of myself. This recipe was built on the confluence of inspiration and necessity. Last week, my wife came home with boxes of Girl Scout cookies. She’d ordered them before the doctor issued his ban on sweets. Normally, an excess of Girl Scout cookies wouldn’t be such a bad thing — heck, it really wasn’t a bad thing, except that they were now my Girl Scout cookies. Sure, I like Girl Scout cookies as much as the next guy — but I can’t go through more than a few boxes without starting to feel guilt and pressure (from my belt). So my wife suggested that I make something with them. A pie crust perhaps? Some other sort of dessert? At first, I scoffed at the idea. 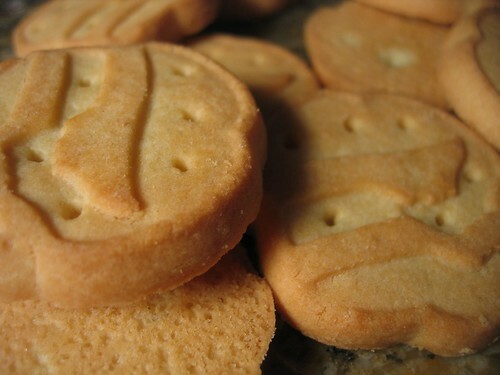 (I imagine there is already a special merit badge out there for the Girl Scout who comes up with the most creative way to use the cookies. Picture some 12-year-old earning her stripes by building a thin mint fallout shelter somewhere in the mountains. How could I compete? And, more important, would I get a badge?) But my mindset shifted when it became clear that I need to get rid of these cookies. Then I discovered that this month’s Hay Hay It’s Donna Day, being hosted by Culinary Concoctions by Peabody, was cheesecake. 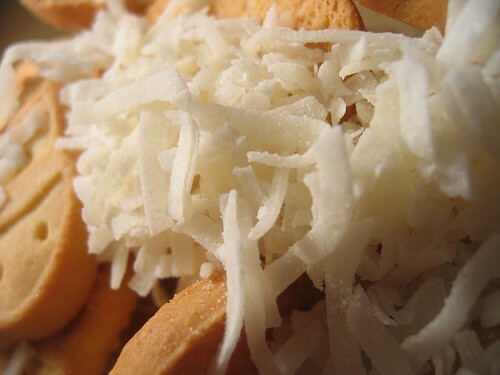 This, combined with a dinner party we had this weekend, created a compelling purpose for these cookies: I would feed the masses with a beautiful and tropical cheesecake. So, once again, this isn’t really a torture device for my long-suffering wife. I mean, it was her idea after all. Wasn’t it? Finally, I want to ask a technical question of you fellow cheescake lovers. 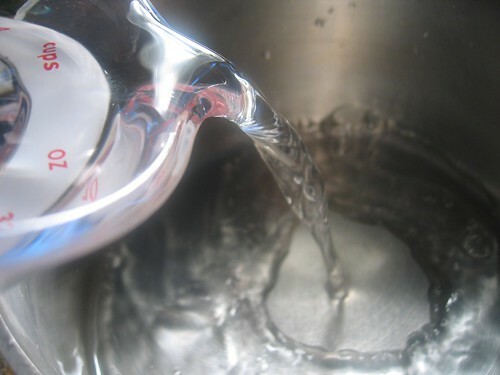 I am using a water bath for my cheesecake. I’ve always preferred this method, because I think the texture is better and believe that having an uncracked top is always a goal. But I’m curious what you do. … So, to water bath or not to water bath? 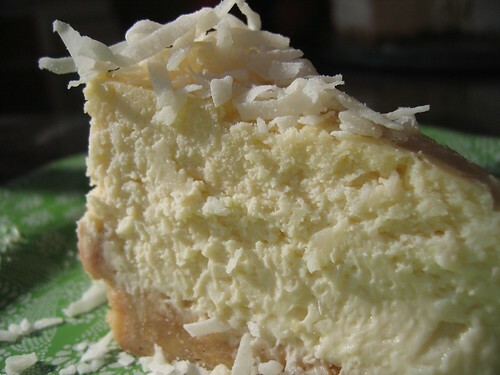 Click here to download the recipe for Coconut Cheesecake. Let’s see… Ingredients: Delicious lobster-like fish, thin slices of bacon, mushrooms lovingly sautéed in butter and a light lemony butter sauce to finish. I think we have a winner, folks. Don’t believe me? 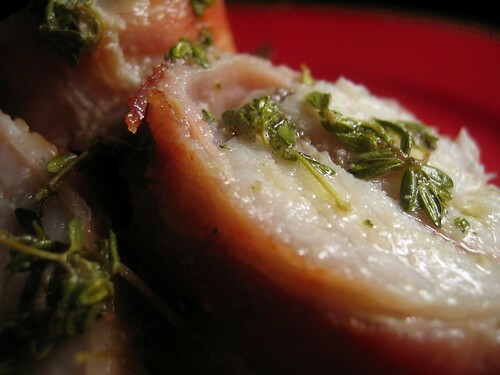 Consider the monkfish, this post’s bacon-wrapped, mushroom-topped offering. Yes, monkfish tastes very good. 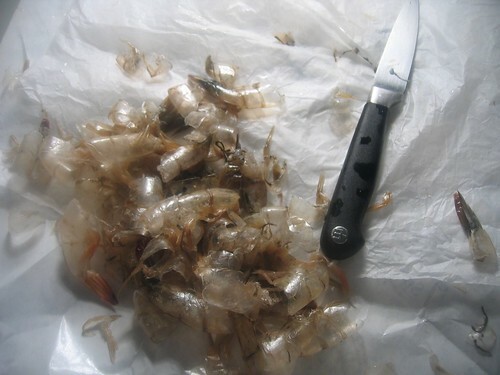 It’s firm and not fishy, and its flesh carries a subtle sweetness – I’ve heard it described as a poor man’s lobster. 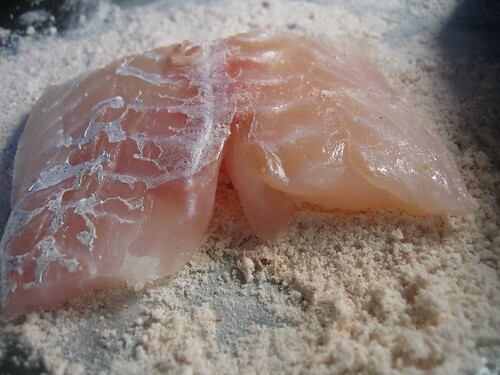 So, yes, eating monkfish was not like eating an old shoe. It married well with the earthy and fragrant mushrooms, it absorbed the maple-saltiness of the bacon, and the slightly lemony butter sauce made the whole thing lip-smackingly good. So, you folks are saying: What’s the problem? Why are you so brave for eating monkfish? 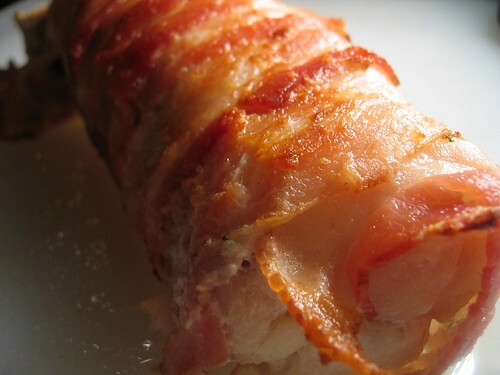 Click here to download the recipe for Bacon Wrapped Monk Fish. 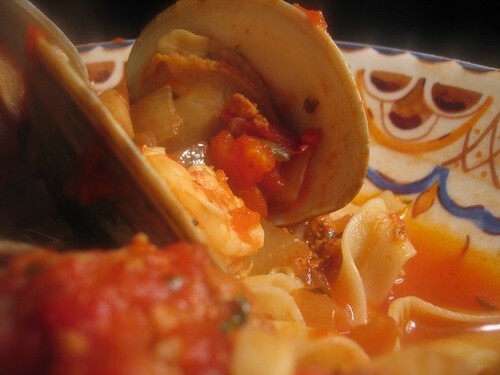 You are currently browsing the My husband cooks blog archives for March, 2007.